Walking through the streets of San Luis Obispo, I noticed the emphasis on local brands – including Jamba Juice, which started in this small California town. The streets were filled with murals and sculpture, and the city even has an infamous bubble gum alley – a walkway with walls covered in discarded bubble gum. But as this is California, it also had some of its distinct history – in the form of the local mission. 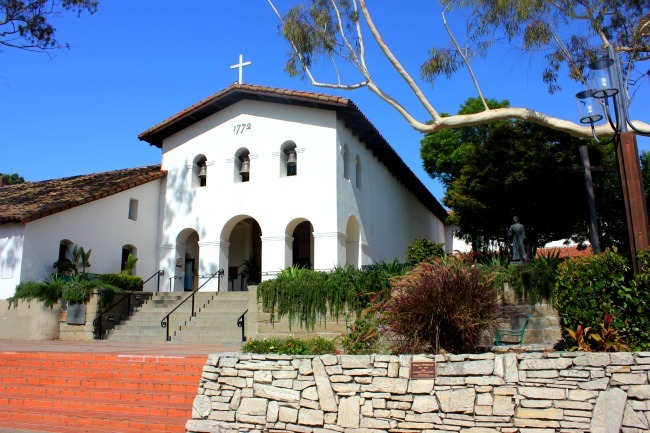 The Mission San Luis Obispo de Tolosa was founded in 1771 by Father Junipo Serra. This building was completed in 1794, with additions, renovations and restoration happening in the 1800s and 1900s. The fifth mission founded by Father Serra, this territory was then controlled by the Spanish, seeking a way to the Pacific Ocean and more trading. The missions were the embodiment of the Catholic Church, putting themselves in charge of the area and its residents – providing a place for spiritual worship by Catholics as well as serving as the community’s courthouse and jail. Its a major object of the past, and while I don’t agree with the work of missionaries, to convert and claim the locals as their own, I still admire these buildings and creators. Forging their way into unknown territory, bringing their homeland, culture and beliefs and enshrining them in a building was not an easy task. And although it was done on the backs of the locals, who arguably didn’t need any saving or changing, its shaped what this area is today. The Spanish style of red tile roof, arched doorways and windows and simple whitewashed walls – classic, bold and recognizable architecture. As I gazed up this massive building, still used and part of the community, I remind myself that its important to remember the past, and try not to repeat it.